I had posted about this under a heading of how to sub. for cream cheese. I wanted to post my followup and findings under a better heading as I believe this is a worthwhile recipe for my collection. I am starting a new category of recipes that take less time and skill but are still reflective of the original in taste and hopefully texture. Not sure what to call the category yet. So here is the start of the new post. 200g Mixed shortenings cut into small pieces: 50g each butter, margarine, coconut, lard (or however) and scatter around on the flour. Starting in the wet middle work with the fingers to mix, slowly adding the dry to form a dough. Knead but do not overwork. Shape into 3 or 4 small oval loaves and place on parchment paper in a baking sheet. Push any exposed fruit pieces back inside loaf. Brush hot loaves with plenty of butter allowing it to soak in. Dust with heavy blanket of powdered sugar. Allow to cool. Wrap tightly in plastic wrap. one last ingredient: Rum, unknown quantity, used if dough seems too dry or drizzle over baked loaf before butter or offered in tea served with stollen. 390F for 15 minutes then 350F for 25-35 minutes. Tastes much better on day 7 after baking-flavors mellowed. Still crumbly-better eaten like a cookie than like a bread. Reduced- very rich with 225. Poss. reduce to 200g next time. FINAL REC- Do butter and shortening mix. Shortening for some height. ** I added a mix of golden raisins and dried cherries I had on hand. Bake (middle rack) 200°c (390°F) first 15 minutes turning down to 180°c (350°F) for 30 - 45 minutes. Remove when golden brown or toothpick comes clean. Brush hot loaves with plenty of butter allowing it to soak in. Dust with heavy blanket of granulated sugar and then powdered sugar. Allow to cool. Wrap tightly in plastic wrap. one last ingredient: Rum, unknown quantitiy, used if dough seems too dry or drizzle over baked loaf (or perhaps the baker? 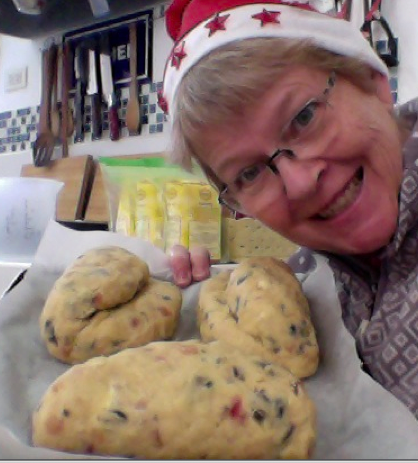 )before butter or offered in tea served with stollen. 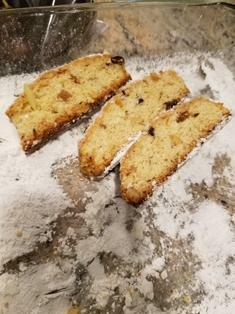 One week after bake and stollen is much better tasting. Still kind of crumbly- not sure if a little added liquid in the recipe would help or make it tough. Here is MiniOven with her Baking Powder Stollen. Nice selfie,Mini! I wonder if the thicker stollen was a little more moist? So please enjoy the recipe. I think it is well worth a repeat next year. I don't always have time for some of the more involved holiday recipes and this fits the bill for my traditional Christmas and New Year's day breakfast with less time commitment. Thank you, MiniOven, for this very delicious recipe.